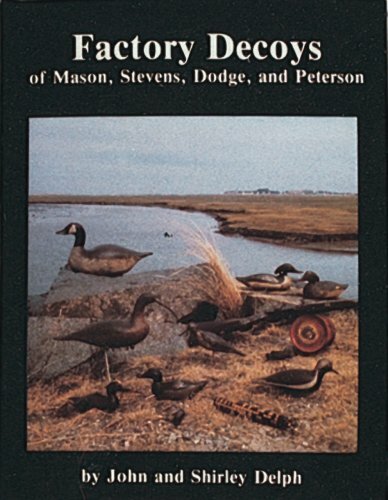 Synopsis: Factory-made bird decoys by Mason, Stevens, Dodge, and Peterson are covered extensively, featuring only the finest examples by each maker in this beautifully illustrated book. Color photographs of over two hundred decoys, plus many black and white photographs and line drawings, make this an invaluable guide in identifying and authenticating factory birds. Included are short historics of each maker. Mason collectors will especially enjoy the chapters on the different species and the special-order models, while a chapter for the new collector is devoted to the characteristics of the different grades of Masons and how to distinguish them. About the Author&colon; John Delph resides in Florida, though he spends much of his time traveling around the country in his work for Richard Oliver Auction Gallery, of Kennebunk, Maine. John is recognized as one of the leading authorities on the firearms and tackle memorabilia in America. Published by Schiffer Publishing LTD, Exton, Penn.